Extrusion issue? Cooling Issue? Something else? I'm having a real W-T-F moment! I'm working on tuning the printing on my new T3P3 Kossel Mini delta. I've been slowly making 20mm and 40 mm boxes. Today I did a 100 mm XY calibration cube. Other than needing to fine tune the first layer, things have been looking pretty good. This evening I decided to try the 3DBenchy. The first four layers looked fine. I then started doing some things around the house, and came back around layer 30. The back end of the boat is sticking up, and looking very messy. 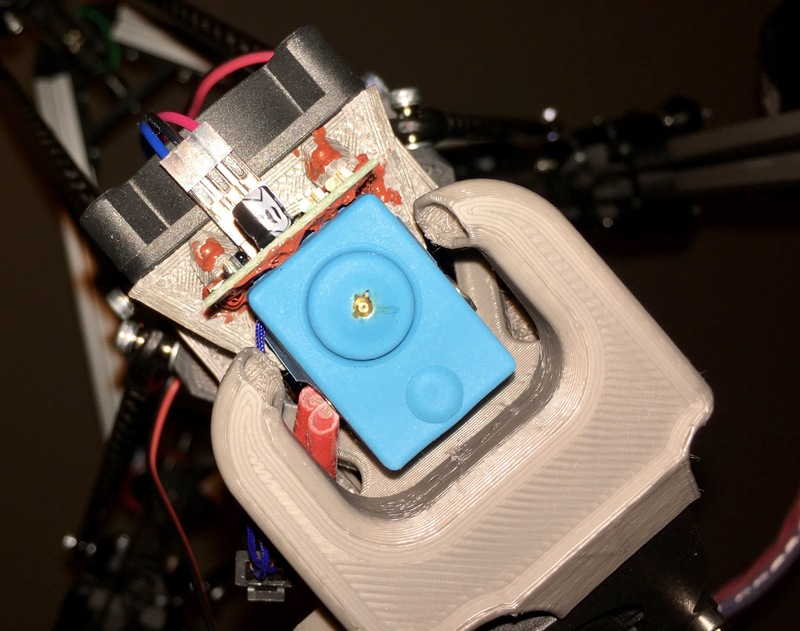 The nozzle and even the IR sensor are dipping into the fresh filament. I watched it closely, and finally had to kill the print after a layer shift around layer 50. It looks like classic over extrusion, but my cubes look pretty good. I didn't change any settings between the cubes and the 3DBenchy. I'm using Simplify3D to create the GCODE. The first 4 layers looked fine too. I guess at this point I'm back to square one. I'll re-check the filament diameter, and probably set the extrusion multiple down to .95 or so from the current 1.00. Could this be something other than over extrusion? Could it be related to cooling? The bow of the boat was facing the parts cooling fan nozzle. Any ideas appreciated. It's frustrating, since I seemed so close. This is PLA, printing at 205C, with the bed at 60C. There are 8 images in the Imgur album linked below. http://imgur.com/a/yLyKn You can ignore the layer shift. I know why that happened, and I killed the print just after that. I'm really enjoying the DWC and the DuetWiFi by the way. Very solid! 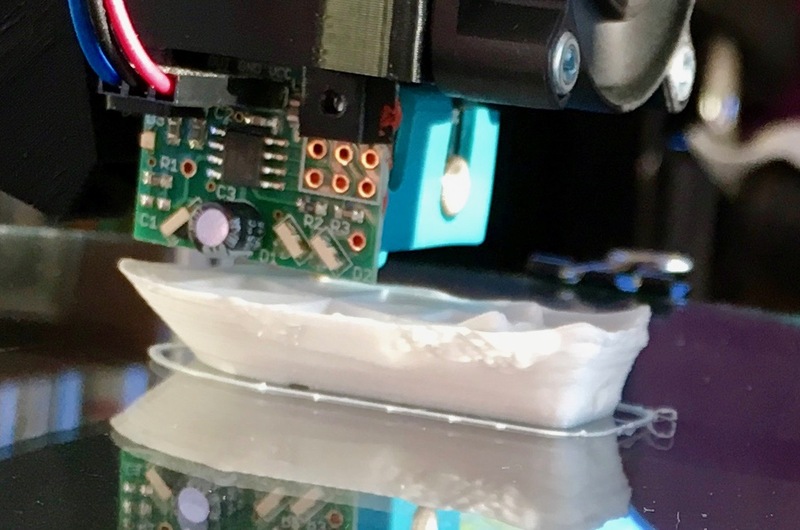 Do you have a working print cooling fan? I doubt that you will be able to print a good benchy without one. Yes, I've got the standard 40mm fan and nozzle as shipped with the T3P3 Kossel Mini. I agree, it almost looks like the fan stopped working. I just turned on the printer now and confirmed the parts cooling fan is still working, but I don't recall if I looked at it during the Benchy print. It was a good day of experimenting. I modified extrusion multiplier. I modified retraction and Z-Hop settings. What was finally clear at the end of the testing is that the primary problem is poor cooling (as David suggested above). While my parts cooling fan is functioning, it appears not to cool well enough to complete the 3D Benchy. I finally proved this to myself by turning the ship around. Immediately, the stern started to come out nicely, and instead the bow had issues. 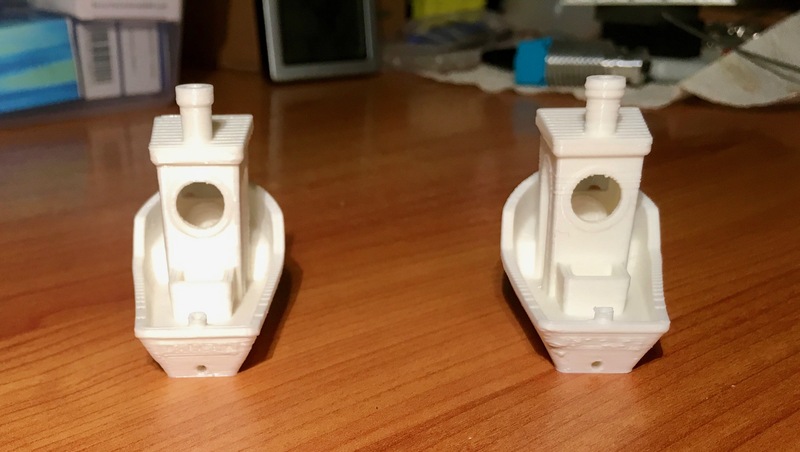 The first four 3D Benchy's (from the left) had the stern towards the rear of the Kossel Mini (away from the parts cooling fan nozzle) The last two had the stern towards the fan. Understanding the cause of the problem makes me feel better about the issue. I'll have to put "enhanced parts cooling" on my list of upgrades. I have the same fan duct design on my delta, and I think the height of the slot that the air comes out of is too great. I intend to reprint it with a shallower slot. However, it may be that you need a Berd-Air or similar all-round cooling system to print good overhangs in all directions. The Berd-Air nozzle looks to be excellent for all-around cooling. On my Prusa i3 MK2, they use a 50mm blower-style fan with a slotted nozzle that is a bit narrower than the default nozzle on the T3P3, and it has pushes enough air to cool the 3D Benchy. I might start out that route, but as long as I know it can be solved, I'm happy. I have a T3P3 Kossel XL and I decided to make a new print fan duct. It should also work on the mini. It's not perfect but I believe it works better than the original. Short version: radial fan - good, axial fan - bad. Long version: an axial fan at the sizes we use has almost zero pressure capability. Best wait to use it is without a funnel, but that spreads air all over the place. What is really needed is some small nozzle(s) to get high air speed, because the printhead will not stay in the same place for too long (see hair dryers). This requires pressure, so the best candidate is a radial fan, aka "blower". A turbine axial fan rotating at high speed will do it too, just like the above mentioned hair dryer, but who has one and who wants to hear jet take-off noise when printing? I've order a 50mm blower-style fan (like the E3D unit linked above). Now to think about how to mount it without re-doing the whole spider. Ideally I can just connect a new mount/funnel to the existing T3P3 spider using the same attachment points. I've used a small Eiffel tower for fan tests on my first delta printer. Some guys have made a similar two-pronged nozzle for the blower-style fan on the MK2, to good effect. A colleague modified a blower nozzle that he created for the Prusa i3 MK2 to be used with my T3P3 Kossel Mini R3. I finally got it mounted and recalibrated the printer this week. The results are very good! With the stock cooling fan, I could not even complete the 3D Benchy (as shown above in this thread). Main downside at this point is the fan is reducing my print area on one side of the bed. It looks like the fan can be tilted up more to get some of that back. To really reduce the issue, I'd have to go with mounting the blower above the effector. Left side is from Prusa i3 MK2. Right side is from T3P3 Kossel Mini R3. The left rear corner of the boat is the only area that start to get a bit soft. The rear nameplate is a bit less clear. The chimney is not quite as nice. Both are printed with Prusa PLA. Both sliced with S3D v4.0 with .2 layer height and similar settings for speed, etc. Note the area where the fan could be tilted up closer to the hot-end. Just needs to clear the rod ends. Grab a set of these. Saves a lot of room and they push some air. With my fan and nozzle, it is right at 50mm tall and fits under my effector mounted vertically. Working on a new mount to put both fans on there. After numerous itérations, I ended with this solution. With 100% PWM, I experienced delamination. 50% would be enough for bridging. Yeah, the 40mm fan would certainly fit better. I'd guess the airflow would be good enough. 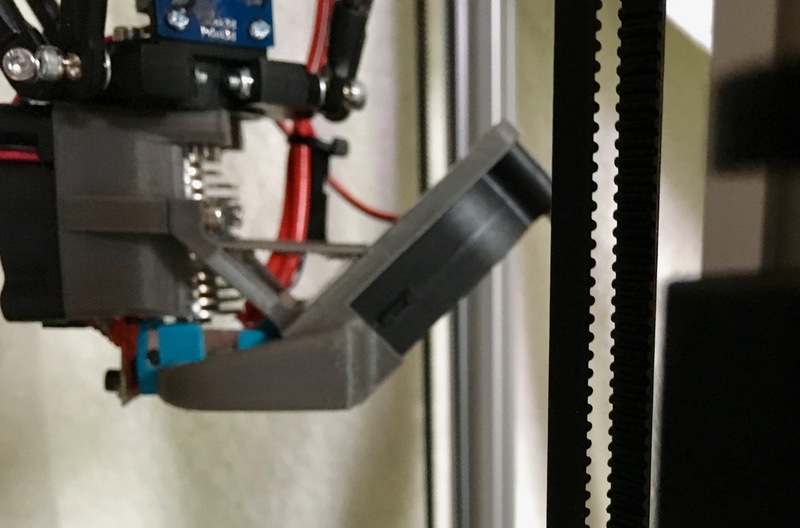 The airflow from the 50mm blower-style fan is such that I can readily turn it down on most prints. Tech-ration's solution is interesting as well! Now that I'm investigating Haydn's effector for magnetic rods, I'll have to see what solutions work with that. I ordered the set of two. Thanks for the link!